EC-Council has been the world’s leading information-security certification body since the launch of their flagship program, Certified Ethical Hacker (CEH), which created the ethical hacking industry in 2002. Since the launch of CEH, EC-Council has added industry-leading programs to their portfolio to cover all aspects of information security including EC-Council Certified Security Analyst (ECSA), Certified Network Defender (CND), Computer Hacking Forensics Investigator (CHFI), Certified Chief Information Security Officer (CCISO), among others. EC-Council Foundation, the non-profit branch of EC-Council, created Global CyberLympics, the world’s first global hacking competition. EC-Council Foundation also hosts a suite of conferences across the US and around the world including Hacker Halted, Global CISO Forum, TakeDownCon, and CISO Summit. Koenig is a leading provider of state-of-the-art technical training and certifications across all popular IT technologies available globally. The world class training at Koenig is offered through several innovative learning methods and delivery models to cater the unique requirements of a global customer base. 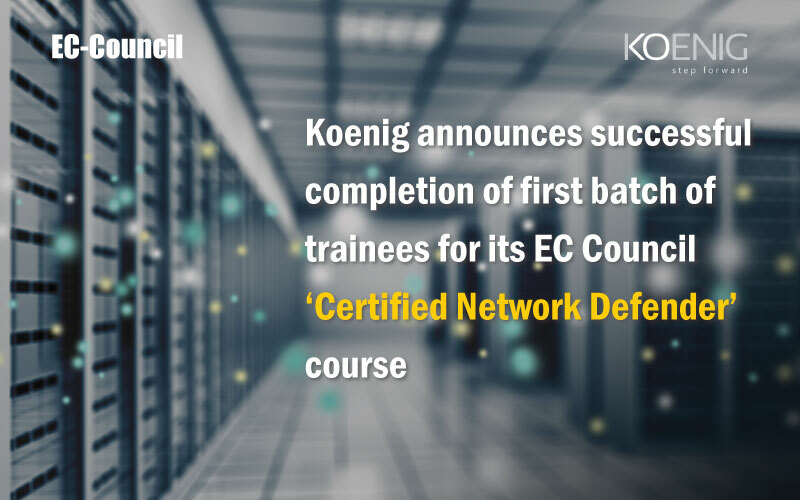 With a workforce of over 300 certified trainers, Koenig offers key certifications via their 30+ authorizations, which includes the likes of Microsoft, Cisco, Oracle, VMware, Red Hat, Novell, EC Council, Adobe, among others. Some of Koenig’s prestigious list of clients in the Middle East and Africa region includes Abu Dhabi Investment Authority, Nakheel, PWC, Abu Dhabi Islamic Bank, RAK Bank, United Arab Bank Government of UAE – Department of Information, Communication, and Technology, ADNOC, DEWA, Du Telecom, the Prime Minister’s Office – UAE, Saudi Aramco, Saudi Chevron, Etisalat Nigeria, Angola LNG and TRA Tanzania. For more information please visit http://www.koenig-solutions.com.